We've seen an electric kart that can do 20 miles per--well, this one goes to 200. Miles per hour, that is. And in under seven seconds, from a dead stop, with a headwind, no less. On Friday, May 4, Larry "Spiderman" McBride (no, seriously, check out that suit!) 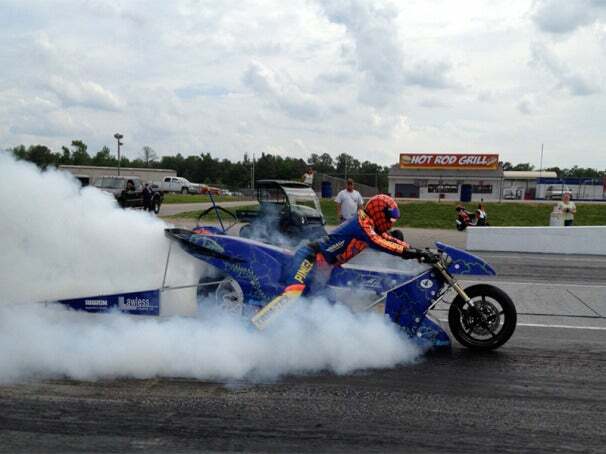 rode the Orange County Choppers electric drag bike Rocket to a record-breaking 201 MPH at Virginia Motorsports Park. The 20-second ride released most of the energy from the bike's 14.2 kWh battery (which could keep your laptop going, continuously, for something like two months), and made Rocket the first electric vehicle to break 200 MPH in the quarter mile. At this rate, we're all going to be showing up at the charging station asking for "more power" soon!